This post was written by Hatchet reporter Ellee Watson. Senior Leah Pascarella reclaimed her singles’ title by beating her teammate sophomore Lana Robbins 6-4, 4-6, and 10-5 (in a tiebreak). Interim head coach Greg Munoz was not surprised to have two GW women in the final of the tournament spread across three campuses – Georgetown, UVa., and the Mount Vernon Campus. “They were are top two players last year, and they will be out top two players this year, for sure,” Munoz said. After going 3-3 at their opening tournament, the Tiger Classic, three weeks ago, the Lady Colonials were warmed up and ready to take the Georgetown Classic. Six players made it into the singles’ Round of 16, three made it into the quarters, and two made it to the finals. Pascarella took the level of play this weekend as a sign the team could do big things this season. Also competing under head coach Munoz this week was the men’s team, who opened up its fall season this weekend with separate tournaments – the Georgetown Classic and The UVA Ranked +1 Tournament. At the Georgetown Classic, freshman Daniel O’Conner made his debut for the Colonials, earning one of only two GW singles’ win on Friday, winning his match 6-1, 6-2 over Norfolk State University’s Igor Braga. O’Conner had a similar streak of success in the double tournament, making it all the way to the semi-finals with partner, senior Ulrik Thompsen, after defeating the duo from Christopher Newport 8-3. The two nationally ranked Colonials, junior Francisco Dias and senior Nikita Fomin, represented GW at The UVA Ranked +1 Tournament and brought along their doubles partners – senior Victor Svensson and sophomore Danil Zelenkov, respectively. Last year, Fomin won the Gold Singles championship and Dias reached the Orange Singles final before losing to the No. 2 player in the country. This go-round, GW would not fair so well. Dias, who is ranked No.94 nationally, won his first match 6-3, 4-6, 7-6, but hurt his shoulder in his second and had to forfeit. It was a sign of the overall rough showing the men’s team had at the tournament this year. Fomin, ranked No.70 heading into the season, lost his first match to North Carolina’s Brett Clark 3-6, 6-7, but bounced back in the back draw bracket to win his next match. Svensson followed suit, losing his first match in three sets, and then coming back to defeat Michigan’s Michael Zhu 7-5, 7-6. Zelenkov would lose both his matches during the tournament. “It is a ranked tournament, so every match is tough. They did okay. 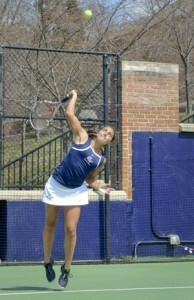 They didn’t win all their matches, but they didn’t lose all of them either,” Coach Munoz said.